As an exclusive agent UPS distributor of SORO, We enjoyed wonderful business cooperation with them. Let's grow fast together! Perfect UPS, Perfect software(SNMP card), Perfect service, that is SORO UPS!!! April, 2015, I visited Sorotec factories, I was pleasantly suprised by their design and artwork to ensure quality!! 4.DIP switch to set AC input voltage range and low battery trip-voltage. 5.Output power factor is 0.9-1 and output socket can choose. 6.Well accept generator’s output and auto generator start terminal. 7.Full automatical and silent operation. 8.Automatically transfer between battery and line modes. 9.Microprocessor control guarantees high reliability. 11.Four-steps intelligent charging control to recharging time. 12.Bypass function with AVR function (optional). 13.The charging current is big up to 85 Amp, can adjust through front panel. 16.Battery type can choose through front panel. Protection for low battery voltage,over load,output short circuit and over- temperature Restrain surge interference,eliminate noise,protection for thunder striking,provide the reliable power to the home appliances. 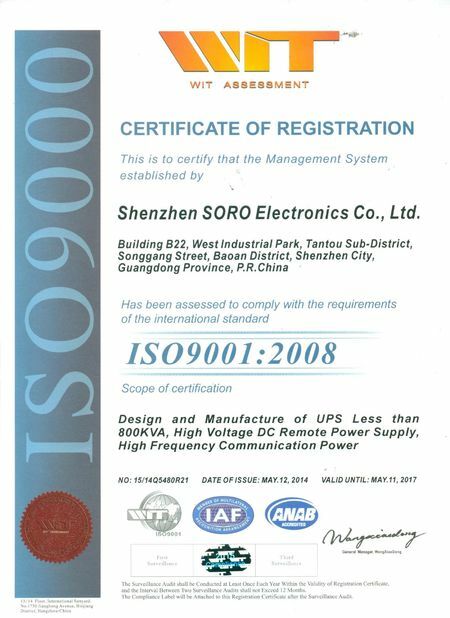 Shenzhen SORO Electronics Co., Ltd is a professional UPS and inverter manufacturer in the field of power electronics for 13 years. We have two large production UPS sites, Zhejiang and Shenzhen. We have own our SMT department. SORO UPS has been a leading enterprise in the UPS industry in China. Since established, The company has carried out three strategies: operation innovation strategy, people-oriented strategy , technical guidance strategy, and implemented strict scientific management with full-fledged quality management system. The company invests 10% of its annual revenue in researching and development every year. We had international advanced equipments for developing , testing and producing. SORO UPS invited the best technical elites at home, meanwhile, the company established perfect cooperation relationship with domestic scientific research units and academies, to strive for making products that reach advanced world standards. The company ranks first in passing the ISO9001 international quality system certification.We established a complete quality system ranging from material source, process, assembling to testing. 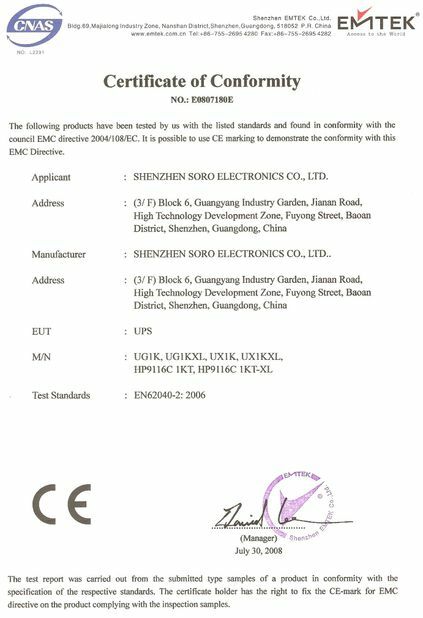 Most of our products have been certified to meet international safety standards, such as CE (LVD/EMC), CUL,FCC. We have co-operative partner throughout the world including USA, Europe, South America, South Africa, Middle Eastern, India, Turkey, Pakistan, Iran and so on .We offer wide range quality products either from our own standard range or customer-made to your specifications. SORO is becoming the most growthful China UPS supplier all over the world. 1. 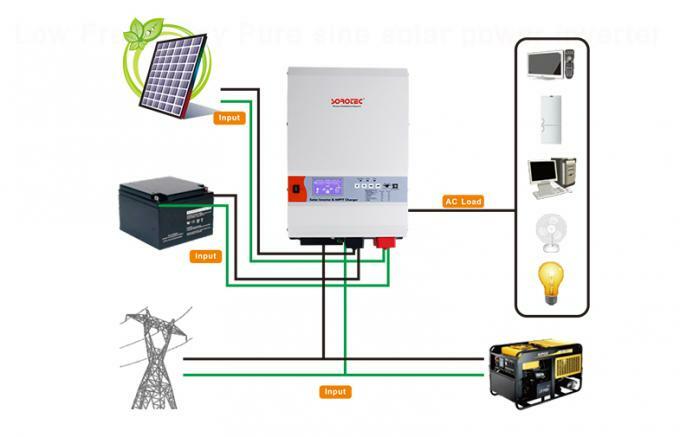 How to choose suitable inverter? If your load is resistive loads, such as: bulbs, you can choose a modified wave inverter. 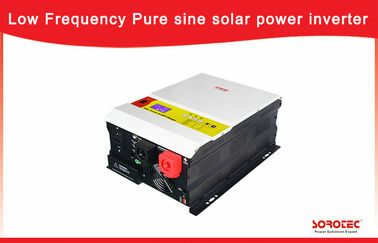 But if it is inductive loads and capacitive loads, we recommend using pure sine wave power inverter. For example: fans, precision instruments, air conditioner, fridge, coffee machine, computer, and so on. 2. How do I choose the size of the inverter? size of the power inverter. Resistive load: you can choose the same power as the load. Capacitive loads: according to the load, you can choose 2-5 times power. Inductive loads: according to the load, you can choose 4-7 times power. 3. How connection between batteries and an power inverter? 4. How to calculate the load of working hours requires configuration of the battery size? China Good Quality Uninterrupted Power Supply Supplier. Copyright © 2011 - 2019 uninterrupted-power-supply.com. All Rights Reserved.